Democratic Rep. Alexandria Ocasio-Cortez hit back at White House press secretary Sarah Huckabee Sanders, who told her to leave climate change up to God and said the Trump administration would ignore the freshman congresswoman's apocalypse predictions. Ocasio-Cortez shot back with verses from the Book of Genesis, which describe people's duty to "serve and protect" the Earth. "You shouldn't need a Bible to tell you to protect our planet, but it does anyway," she added. — Alexandria Ocasio-Cortez (@AOC) 23 января 2019 г. The congresswoman, who represents New York's 14th Congressional District, had earlier warned that "the world is gonna end in 12 years if we don't address climate change." She was apparently referring to a 2018 UN-backed report which said climate change would become irreversible if people did not limit carbon emissions. However, Sarah Sanders, who calls herself an evangelical, appeared to be critical of these apocalyptic predictions. "I don't think we're going to listen to her on much of anything," she said of Ocasio-Cortez, "particularly not on matters we're gonna leave in the hands of a much, much higher authority — and certainly, not listen to the freshman congresswoman on when the world may end." — Darrell B. Harrison (@D_B_Harrison) 23 января 2019 г. — Jennifer S. Murphy (@DrJenMurphy) 24 января 2019 г. …others claim that the Bible is also at odds with something she stands for. The bible also says that a man who layeth down with another man is a sinner and "The wages of sin is death." Go home AOC where you belong. — Dawgdeley (@Dawgdeley1) 24 января 2019 г. The Bible also mentions protecting life and calls the unborn humans in God's image and likeness. Where do you stand on that oh preacher? — Carmine Sabia (@CarmineSabia) 24 января 2019 г.
Ocasio-Cortez's supporters insist, on the other hand, that according to Sarah Sanders' logic, God should enforce the US border instead of a wall. I find it interesting the same people who want to leave climate change up to God also want to spend billions on national defense. Won’t God protect us from our enemies? — Peter Delevett (@peterdelevett) 24 января 2019 г. — Jamie 🛸💚🐾 (@Jamie1074) 23 января 2019 г. Do these folks realize that the Bible instructs us to be good stewards of the earth? Oh, that's right they really don't give a crap about the Bible. 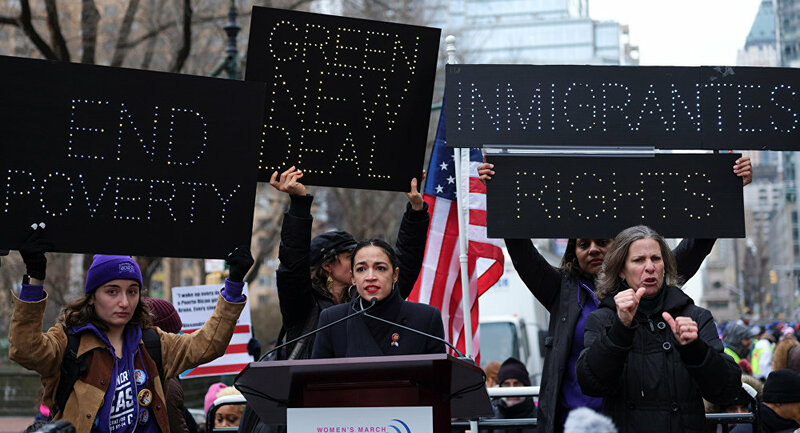 — Dennis M. Francis (@tdpubs) 23 января 2019 г.
Alexandria Ocasio-Cortez has been one of the most prominent backers of the so-called Green New Deal, a programme developed by young US activists that aims to tackle climate change by expanding renewable power sources, building an energy-efficient power grid, removing greenhouse gas emissions and investing in "green" jobs and infrastructure. President Donald Trump has been sceptical of climate change: he withdrew the US from the 2015 Paris climate agreement, citing its negative effect on the national economy, and said he "did not believe" his own government's report which said that the US would lose hundreds of billions of dollars due to climate change by the end of the century.